In 1955, Fr George Barringer, was asked to become the Parish Priest for Borehamwood North and oversee the building of a 2nd Catholic church in the area. Fr George was a shy, retiring man, he had been an army chaplain in World War 2 and had been at Kenton Parish for the previous 10 years. St John Fisher & St Thomas More (SSJFTM) was to become his life and his passion as he tirelessly battled to move the project on. 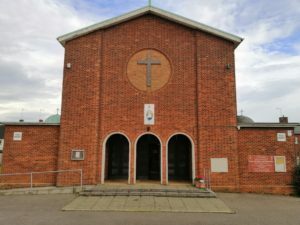 The Diocese had decided that, given the intensive building programme in this area of Hertfordshire and the relocation of so many families from London, a further church was needed in the area, alongside St Teresa’s, which had been built in 1925. Fr George took over the tenancy of a council house, 146 Thirsk Road and helped out at St Teresa’s assisting Fr Joseph Murray, whilst the groundwork, planning permission etc, was carried out. It wasn’t until 1956 that the Vicar Capitular authorised the building of the new church at a cost of £45,511, with the Diocese contributing £15,000. Whilst building was going on, Fr George carried out Mass each morning for his new flock in his house, making the most of what furniture he had for the Altar, etc. He also held Catechism classes there. As more Construction Workers came on site, a canteen was put up for them and Fr George persuaded the Construction firm to let him use the Canteen on Sundays . It was down to the ladies of the Parish on a Sunday morning to make the canteen suitable for Mass, bringing furniture and equipment across unmade roads and paths. One important job was covering up the girlie posters that usually adorned the walls. After mass, everything, even the posters where put back into place for the men. In time, Fr George hired Meryfield School which made life a little easier, but all the funerals, marriages and baptisms took place at St Teresa’s which meant another procession, carrying altar furniture across the fields from Thirsk Avenue. On 21st July 1957, the foundation stone was laid by Cardinal Godfrey in the pouring rain and the history of Borehamwood North was placed in a cylinder under the stone. Originally, the church was just to be in the name of St John Fisher, there already being a few churches in the area dedicated to St Thomas More, but Fr George had pressed for St Thomas More to be added and after some persuading, Westminster agreed to include both names. The foundation stone may have been completed, but Fr George’s troubles weren’t over, by December 1959, Archbishop’s House advised that the Parish’s debt for all building work, including the Presbytery , now stood at £43,917.12.3. Fr George would spend the next decade, tirelessly raising funds, with Bazaars, jumble sales and a Football Pools Association. Fr George Barringer remained Parish Priest until his death in 1978, at the age of 71 years. He is buried at Allum Lane Cemetery.